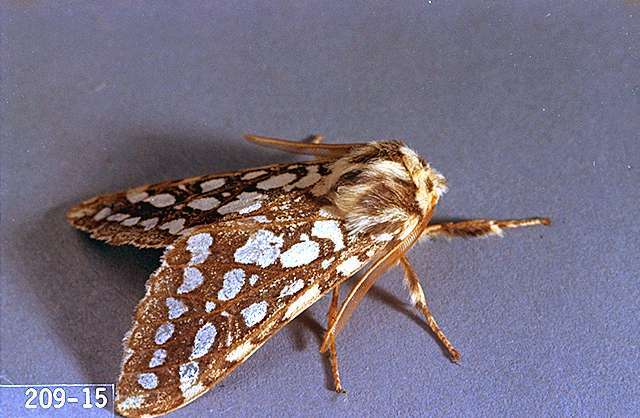 Pest description and damage Adult moths are brownish or tan with distinct silvery translucent spots on the wings. The caterpillars can reach 1.5 inches in length and are mostly reddish-brown with some blue-black or yellowish hairs. 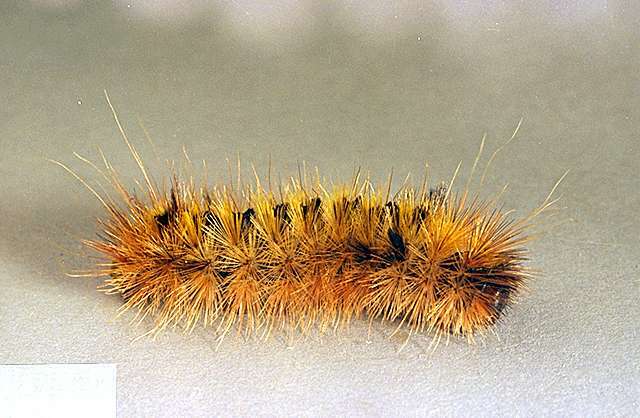 The caterpillars of the silverspotted tiger moth feed on the needles, often "tenting" branches with dirty-looking webs. Feeding occurs through fall and winter, with webs becoming more noticeable by spring. Buds are not harmed and the new growth in spring usually covers most damage. Minor infestations cause little harm to landscape trees, though there have been reports of forest defoliation. 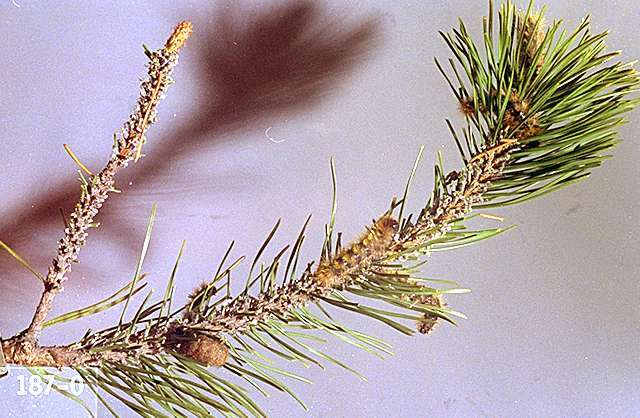 Douglas-fir is the preferred host, but pine, arborvitae, spruce, and true fir also are attacked. Biology and life history Clusters of round emerald green eggs are laid on needles at the tips of branches. In fall, tiny white larvae make small tent of fine webbing at the tip of a branchlet. The larvae hibernate in dense clusters in these webs. They feed on host tree foliage on warm winter days. As the larvae mature, the damage and webs become more noticeable causing some concern among homeowners. In June, the mature larvae may be found wandering on non-host plants, patios and decks, in search of a good spot to spin their cocoon. Cocoons consist of the reddish-brown caterpillar hairs interwoven in the silk of the cocoon. This insect is usually well controlled in landscape settings by parasitoid wasp (Ophion ssp.) and flies (Tachinids) that cause the population to crash. Tachinomyia similis (Williston) is a large fly that also parasitizes this insect. Prune out and destroy tents with caterpillars. Caterpillar hairs can cause skin irritation in some people if they are handled without gloves. Don't rub eyes or hairs can become painfully embedded in the eye tissue.